Price/market value: Price level between buyer/interestiing party and Gallery JT Ltd can be agreed upon. See elucidation of sale conditions under information. Estimated period: 1911-1919 or 1937- see more information below. 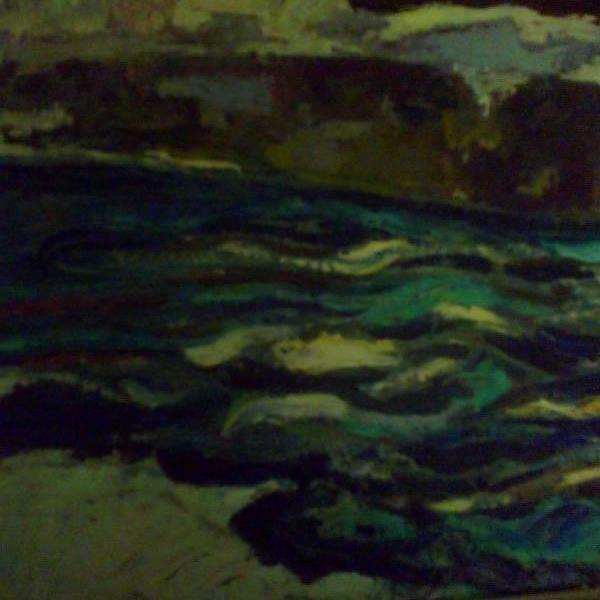 © GALLERY JT Ltd This painting is kept in safe storage, inside bank vault. Price example price information: In 2010 a painting picturing Stockholm city painted by Isaac Grünewalds wife Sigrid Hjerthén was sold for 470.912 USD in Stockholm. Water can be seen in this painting and Isaac Hirsche Grünewald(1889-1946) lived nearby water in several locations among them near the Karlberg canal when he lived in Grünewald villa that is situated only about 300 metres away from the famous hotel Grand Hotel Saltsjobaden. Other habitats of Grünewald were Kornhamns square and he also had a studio at Engelbrekts street in Stockholm. The famous artist Eniar Jolin associated with Grünewald is well known for having painted oil paintings with motives both from Kornhamns square and the Karlberg canal in Stockholm. Sigrid Hjerthen (the wife of Isaac Hirsche Grünewald) and Isaac Grünewalds style in painting is called avantgarde and they are mentioned to be pioneers of the modernism movement. 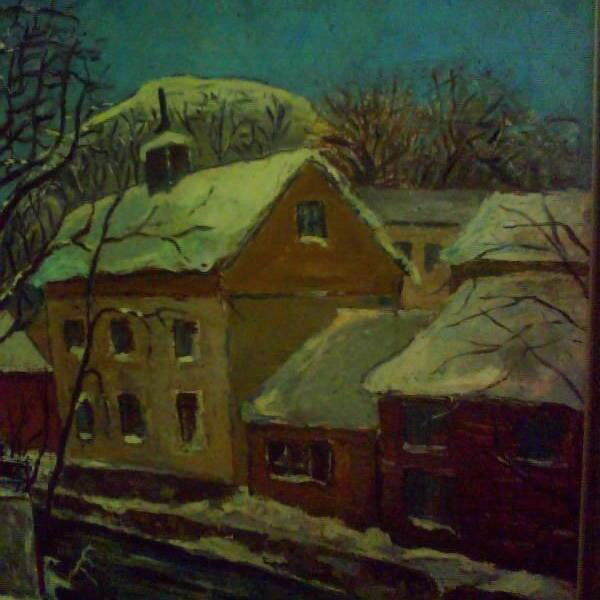 The definition of Isaac Hirsche Grünewalds painting is that he was a great colorist with an impressionistic foundation but his tecnique was expressionistic. A cautious defination of period is 1911-1919. Some years after 1920 Grünewald moved to their flat, apartment situated high up in the building and many paintings with an astonishing view over Stockholm were painted during their stay in this location. It is also possible that this painting was painted in the year of 1937 or hereafter when Isaac Grünewald lived in the Grünewald villa. Not all paintings by Isaac Hirsche Grünewald are dated. From the 1940ths it is described that Isaac Hirsche Grünewald came into a calmer more intimate state of mind in his artistery. *In the year of 1911 it is written that Isaac Hirsche Grünewald painted one of his very first paintings with a motive from Stockholm. Isaac Hirsche Grünewald hereafter had eight (8) separate exhibitions iin Stockholm the period 1911-1944. From the year 1920 and hereafter it is described that Isaac Hirsche Grünewald were on foreign travels. As described below Stockholm city was toatally different with aproximately 400.000 inhabitants and you were probaly not allowed to paint or portray in painting whatever you wanted for in the year of 1912 when the olympic games took place in Stockholm the Olympic games poster was confiscated by the police because of immorality after protests from both America and the Netherlands. Signed: Grünewald to the lower left within the painting, no date. When comparing this painting with other paintings that have been sold recent years I have only found a few paintings signed with year. This paintings signing is much alike for example the signing of an oil painting that was sold in a fine art auction nr.711 Modern in Stockholm not long ago and also alike the signing of the oil painting named Surroindings of Toulons ,1927 exhibited in Liljevalchs fine art gallery in Stockholm. Provenance: This painting was given to a charity organization where it was bought by the present owner. This painting is painted in the way that Isaac Grünewald is famous for having been painted and the colours and the composition are well in line with available descriptions over Grünewalds artistry. Isaac Hirsche Grünewald is well known for an intellectual quality with raw dark colours against the very etheral light fine colours in very bold compositions. Read more about Grünewalds colouring and influences from the impressionists movement below. Considering the strong influencens from Cezanne that is described by among others J.P Hodin clear recemblances with Cezanne can be noted in this painting: In the painting Trees in a park (The jas de bouffan) from 1885-1887 by Paul Cezanne Pushkin museum of fine arts in Moscow some obvious similarities in the way of painting can be noted above all the depicting of houses and the way the background is painted, the similarities is obvious even though Cezannes painting is not a winter motive. The admiration and influence from Cezanne is also mentioned in Grünewalds own times: According to information from Hodin the famous writer August Brunius writes in Kunst og kultur Bergen 1911:Quote: In last mentioned study it is told about Grünewald that he had a deep admiration for Cezanne. End of quote. It is possible by comparing this paintings motive with images of Stockholm from the arly 20th century to find out exactly what buildings that are depicted. Within this painting there are especially two important elements that are noticeable and described as typical for Grünewald: The paintings composition and also the colouring in respect to the use of light and dark colours according to J.P. Hodins description below. Read also about Grünewalds influences from the impressionists/the postimpressionists below. 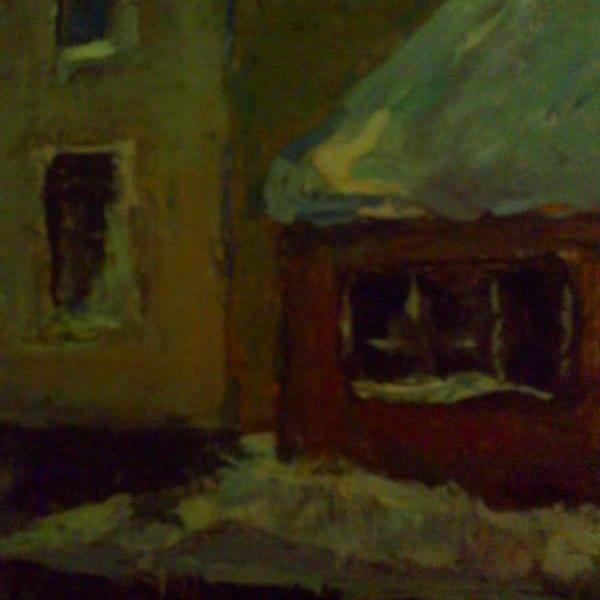 In this painting there are no signs of cars or electric light which can facilitate the exact dating of this painting. Electic lights became ordinary available not until after the First World War and probably the same is valid for electric central heating. 1903 In Stockholm the very first block of flats, apartments house in american english received central heating system. 1904 Isaac Grünewald started his artistic career 15 years old according to J.P.Hodin. 1905-1908 Isaac Hirsche Grünewald studied in Stockholm in the artists association school of fine art. 1908 Isaac Hirsche Grünewald went to Paris together with Einar Jolin. In the year of 1908 Matisse published his own declaration of artists creed and later became too occupied with his own art to be able to educate. Rudolf Levy thereafter presided the school as a free academy. Louis Vauxhalles named the Matisse style in painting to: fauvism, -read more about this style in art below. The author J.P Hodin tells that you can see in the paintings by Grünewald that Grünewald was mostly influenced by the art of Cezannes during his studying years at Matisses art school. 1909-1910 Matisses art school in Paris. 1908-1911 Grünewald stayed at Monparnasse where Academie Matisse was located. Another famous artists staying in Monparnasse was for example Leger in 1909. 1911 Hodin mentions that Grünewald painted one of his very first motives from Stockholm called Nybroviken. SEPARATE EXHIBITIONS IN STOCKHOLM: 1911, 1925, 1930, 1934, 1937, 1939, 1942, 1944. 1911 Isaac Grünewald marries the artist Sigrid Hjerthén. 1911 Grünewald had his own studio at Rue Campagne Premiere 10 in Paris. 1912 Isaac and his wife Hjerthén together had a studio situated at Engelbrekts street in Stockholm. Grünewald and Hjerthén formed a new group of artists named: The eight. They painted expressionistic and exhibited together. This group of artists was also publically named the Grünewaldists. 1912-1920 Grünewald lived in Stockholm at the adresses Kornhams square and Katarina road. 1913 The Grünewalds moved to Paris and became familiar with among others Picasso. 1913 Hjerthén and Grünewald moved from Engelbrekts street to a huge studio at Katarina road situated by stadsgarden and this studio was kept by Grünewald during the whole time of his life. Isaac Grünewald won the first price 1.000 SEK in the contest of decoration of the marriage room in the city of Stockholms new town hall, (city hall american english). 1914 After debates that occurred the committe decided that the one who had got the second price Georg Pauli should be accepted for the decoration instaed of the winning proposal by Grünfewald. 1923 Grünewald bought a car according to information from Hodin and it did not take a long time until both Matisse, Picasso and several other artists also had their own cars. 1932-1942 Isaac Grünewald was professor in the Academy of arts in Stockholm. 1937 Grünewald lived in the Grünewald villa in Saltsjobaden in Stockholm. See also Grünewald exhibitions year by year below. 1. JP Hodin ISAAC GRÜNEWALD, Ljus Stockholm printed by Esselte Ltd Stockholm nr: 1 out of 500 numbered copies composed by the artist Ivan Grünewald. The writer Hodin tells in the preword that he has met Isaac Grünewald in person and furthermore that Isaac Grünewald himself has read the whole of this manuscript in 1946. In this book there are over 135 literature references to books, journals, magazines, Grünewalds manuscripts, catalogues. 2. The world art history, Editions rencontre Lausanne 1965.